I was a bit weary about starting the process of watching through The Clone Wars initially. I had very fond memories of the Genndy Tartakovsky‘s Star Wars: Clone Wars (2003) series, and I’d still consider it one of the very best of American cartoons even after having rewatched the entire series endlessly. The fact that that series had been made out of continuity for George Lucas’ series annoyed me; also the fact that they had abandoned the hand-drawn 2D animation of the earlier series for a more CGI approach. On top of that, the idea of a “secret” padawan for Anakin Skywalker, Ahsoka Tano, made a bit nervous. 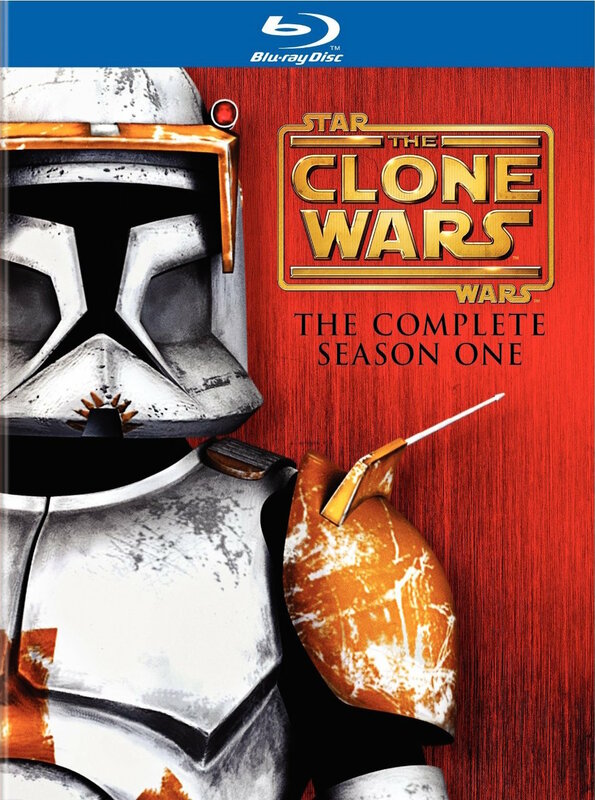 However, I was happily surprised to see these concerns were needless – the first season of Star Wars: The Clone Wars is solid entertainment, if unbalanced, with some spectacular episodes collected with some more clunky ones. In many ways I feel Lucas was justified in discounting the other Clone Wars series for this one. Whilst that show was a brilliant series, it didn’t really flesh out the characters so much as the conflict. This new series takes a different approach – rather than showing specific conflicts across one micro-episode, you’ll get trilogies of episodes or two-parters fleshing out a specific conflict in the Clone Wars. I really like this approach, and it showed that the show-runners had faith in the audience to be able to keep up and understand what was going on. They were clearly making a show for all-ages as opposed to just for children. This vast amount of story and screen time also lead to valuable character insights – we can see these characters developing and changing before our eyes, especially Anakin Skywalker. His relationship with Padmé Amidala is explored, showing the difficulties of keeping their love secret, something the films struggled to depict. It’s also great seeing Anakin as a leader and a hero; his teaching of Ahsoka Tano particularly brings this out. Ahsoka isn’t a bad character as I expected, but well written and interesting. I have a feeling that her character will grow throughout the coming seasons and so will my kinship with her. One of the best elements of the show, however, is exploring the lives of the actual clones. In the prequel films this is abandoned in favour of highlighting the struggles of the Jedi, but considering how many more clones there are I was always a bit surprised there wasn’t a clone character in the prequels that would be our eyes in the general movements of the war. This series achieves that, and it’s really interesting to see. Our key clone characters are Captain Rex and Commander Cody, two elite troopers who often command lower-ranking troopers in volatile combat scenes. You really get a feeling that there is a life and culture around the troopers, creating distinct personalities. You really root for them, which makes it all the more heartbreaking when Obi-Wan Kenobi calls Cody a good man, as Cody tosses this aside and attempts to kill him in Revenge of the Sith. Whilst the show never deals with the onset of Order 66, the order to kill all of the Jedi, it’s a spectacular and emotional part of the series, getting the viewers to commit to the clones as individuals. Dee Bradley Baker excels at voicing all of these different clones and imbuing different personalities into each of them. The episodes “Rookies” and “The Hidden Enemy” do this particularly well. On top of the great storytelling, the animation is frequently beautiful. With really great cinematography, the action scenes are always exciting and visceral. The lightsaber scenes are also really well choreographed – scenes in particular include the duels between Asajj Ventress and Ahsoka Tano and Luminara Unduli, and the battle between General Grievous and Kit Fisto and Nahdar Vebb. The character and creature designs are always great, and the background detail is really great. It frequently feels like I am watching a professionally animated film; the fact that so much time, money, and effort has gone into a television series really makes me happy. The landscape shots, always looking like etchy paintings, are particularly wonderful. The season does falter occasionally though; any episodes dealing with Jar Jar Binks are as clumsy as the character, and I really wish they would make less use of him and more use of Naboo. Additionally, whilst the Separatist battle droids can be really funny at points, it struck me as a bit out of sync with the realities of the prequel films, and a bit forced as well. Additionally episodes dealing with heroes and villains who both appear in the films are spectacularly undramatic for me – I had no feeling that this was anything beyond a cool lightsaber battle, because ultimately I know both of these characters will survive until at least Revenge of the Sith. There are exceptions however. “Rookies” effectively portrays life in the ranks and is one of the best episodes of the season. Whilst the clunkier episodes aren’t always great, there is every now and then a stand out episode that reminds you why Star Wars is just so goddamn awesome. The first of these, and probably my favourite of the series, was the self-contained episode “Rookies.” It follows a group of rookie clone troopers who are attacked by stealth droids on an outpost protecting Kamino. They have to retake the base and stop the OK signal to alert the Republic forces that Separatists are attacking their home-world of Kamino. They receive some extra help from Rex and Cody. It’s a concept that could be expanded into a film, but it’s a brilliant piece of economic writing – stuffing in great personalities of around five new characters in 20 minutes, giving each a chance to shine. I don’t think anyone will forget Heavy’s last words, which will go done as one of the best moments in Star Wars storytelling. The atmospheric episode “Lair of Grievous” portrays the titular villain as terrifyingly as he should have been in Revenge of the Sith. I had been a bit reticent about General Grievous up to this series as well. In Revenge of the Sith, as well as the first couple of episodes, he is cowardly and somewhat weak, at complete odds with his terrifying appearance. I missed the danger I felt and just how terrifying he was in the 2003 series, which remains perhaps one of my favourite Star Wars stories as he kidnaps Chancellor Palpatine before the events of Revenge of the Sith. However, the spectacular episode “Lair of Grievous” restores him to his former glory. It’s a brilliantly atmospheric episode, and has something in common with the film Aliens (1986). It also gives some much needed character development and background to General Grievous, showing the true extents of his grisly nature. The final episode in the Ryloth trilogy, “Liberty on Ryloth,” is a stirring conclusion and a brilliant showcase of Jedi Master Mace Windu’s proficiency as a Republic general. However, the slam-dunk ending of the series, the trilogy of episodes dealing with the conflicts over Ryloth, are nothing short of stunning. Each episode works on their own, yet builds on the last to show a truly multi-faceted narrative. You feel like you are watching real history, seeing the ins and outs of the famous battles of the Clone Wars. It’s in this moment that that promise of excitement and action, when Luke Skywalker first asked about the Clone Wars in Star Wars, is fulfilled. This trilogy is full of great moments, and it’s a truly amazing piece of Star Was storytelling. It’s among my favourite of the episodes, and perhaps the first truly epic battle depicted in the series in full. The final episode of the series, “Hostage Crisis,” introduces the villainous Cad Bane. If the season had ended there, I would have been pretty happy. Despite an unbalanced first season the show had kept my interest with several fantastic episodes. But the show had to go and deliver the best episode yet as their final offering, the stellar “Hostage Crisis,” which introduced a new, brilliant villain. The bounty hunter Cad Bane and his cohorts have arrived, and I feel they will be a major presence in the series to come. Bane and his allies seise control of the Senate building in an attempt to force the release of Ziro the Hutt (the rather annoying villain of the feature film that preceded the series). It’s a masterclass in suspense, as Anakin is trapped inside the building without his lightsaber and must stop Bane from killing the senators (including Padmé) that he holds hostage. It opens up a door for what is to come in Season Two, ominously titled Rise of the Bounty Hunters, and introduces perhaps the second significant original character of the series. I can’t wait for what’s to come. Despite the falters and the clunky episodes, The Clone Wars has grabbed me as exciting Star Wars storytelling always does.